Pricing structure update! Please read new Tier pricing documentation. Choose either single site price at $5 or a lifetime license for $45 – Neither pricing option includes support. Update March 2017: There is only one price point but your license is a lifetime license, no support will be offered for this product. 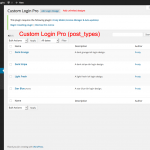 Custom Login Pro is a WordPress plugin that gives you total control of your wp-login.php page. 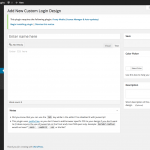 Create unlimited designs using WordPress’ native custom post types! That’s right, save as many different designs as you like, or just use one and done. Custom Login Pro comes with four default “posts” known as designs. 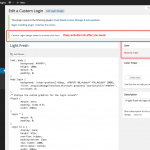 Each post allows you to upload your own images and set your custom CSS in the content body. Custom Login Pro is the PRO version of Custom Login, a free plugin you’ll find here and in the WordPress repo. The PRO plugin was rewritten from Custom Login lite 2.0 and utilizing Post Types to create the login CSS. This allows unlimited “designs” held in posts and can be activated as needed. 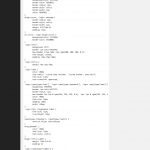 Upon activating the post, a design (which is the post_content or the CSS) gets written to a CSS file so that the database is never accessed for super fast load times even on shared hosts. The PRO version is not an upgrade to Custom Login nor does it extend the features of Custom Login like other Custom Login extensions. It is its own plugin and will de-activate Custom Login upon activation. 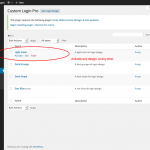 The PRO version removes all default WordPress style sheets from the login screen which are hooked into login_enqueue_scripts (which the free version does not). The PRO version also writes the CSS to a file which allows the page to load the design without having to access the database. As of version 1.5 Custom Login Pro no longer supports all the Custom Login extensions it previously did. In fact, this plugin hasn’t seen some real love in quite some time. Version 2.0 is in the works and will now include all the features of each extension in one package. Things to note when this estimated new version is released is a higher purchase price and will likely fall into our tier 3 pricing structure and have limitations on license options. Every previous purchase within the last year or those who have a valid license will be able to update to the new version at no cost. As always those that wish to renew there license will receive a discount code to do so! Click to activate the design. Activate the new design after you click save.